This is just the kind of pudding I like. It’s light, clean and finishes off a meal beautifully. The flavours are pure and fragrant, the honey is intensely sweet, while the yogurt provides the bass notes and keeps the flavours grounded. Preheat the oven to 180°C/gas 4. 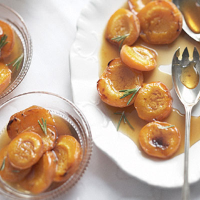 Lay the apricots cut-side up on a baking tray, drizzle with the wine and sprinkle over the sugar. Bake on the middle shelf of the oven for 20 minutes, or until soft – they may caramelise slightly around the edges. Meanwhile, put the honey in a small saucepan. Bruise the rosemary sprigs by hitting them gently with the handle of a knife, then break them up and add to the honey. Place on a low heat and warm through. Remove and set aside. Divide the apricots between 6 plates, spoon the warm honey over and serve with the bowl of yogurt. Catch the echo of those wine-teased apricot flavours in a tiny glass of tokaji.